During the lifetime of the Parsi composer Kaikhosru Shapurji Sorabji (1892-1988), English-born and -based, but god help anyone who called him English, all sorts of legends grew up around him: that he composed works of inordinate length, that they were of a technical difficulty that placed them beyond the abilities of even the most gifted pianist; that in any event it didn't much matter since Sorabji had banned the performance of his music. Like many myths, these ones also have their feet in fact. His longest works may approach the eight-hour mark. Very many of his scores are fantastically complex. And Sorabji himself stated in 1959 that he neither sought nor encouraged public performances of his works because "they are neither intended for nor suitable for it under present, or indeed any foreseeable conditions: no performance at all is vastly preferable to an obscene travesty." But the truth is rather less black-and-white. There are works in the Sorabji catalogue that are brief to the point of aphorism and others that could almost be described as listener-friendly. A growing body of pianists is proving that his music is indeed playable. And when the first wave of these dedicated players appeared – Yonty Solomon, John Ogdon, Michael Habermann and Geoffrey Douglas Madge chief among them – Sorabji was happy enough to give his blessing to their playing his music in public. One member of that avant-garde, the Baltimore-based pianist Michael Habermann, has just released a third CD of the music of Sorabji on Elan (CD82264), following up two earlier efforts, on MusicMasters (MMD60118W) and AS&V (CDAMM159) – both apparently recorded at the same concert in 1984 though, confusingly, the one work in common to the two discs has different timings on each. In his new release on Elan Habermann has returned to the gentler Sorabji, the two main works in his programme (likewise compiled from live recordings, made over the years, from 1980 onwards) being Sorabji's extended nocturnes, Gulistan and Djâmî. Habermann 'phoned me on a recent Saturday at the appointed hour – lunchtime here in Paris, which means that my caller, ringing from Maryland, was up bright and early. I asked him first how he came across Sorabji's music, since even now it still tends to be something of a secret among initiates. It turns out that chance plays as big a role here as it does in most things. Habermann, who has a soft-spoken, easy-going, friendly voice, explains: "I was living in Mexico City as a teenager (my father had a job there) and was exploring the literature. I was in The English Bookstore and went to the music-book section. Lo and behold if I didn't see this amazing piece of music [the Fantaisie Espagñole ] by a composer with the equally strange name of Sorabji. I leafed through it and it looked unplayable – I had never seen anything as complicated as this before. So I didn't buy it! What was the point of buying something I would never be able to learn? But I came back a few days later and it was still there, so I bought it for a dollar. That's how my interest in him began." What, then, was Habermann's background in music, that he found such an affinity with Sorabji's highly individual, fiercely polyphonic, arch-chromatic soundworld? Was he already acquainted with the music of composers like, say, Szymanowski who could have prepared his ears? "No, I had only really just started. I was a very late starter: I began the piano at age fourteen. We used to listen to Schnabel and other classical records at home, but we didn't have a piano until much later. The Sorabji was a curiosity. I had put it aside to begin with, but then I began to wonder how it would sound, and I set aside some time every evening. Eventually I was able to play it – but that was many years later." How did he follow up this early encounter? "I looked in the reference books and at first I didn't find anything. Then one book pointed to England, and so I wrote to Oxford University Press, who were carrying his works at the time, and they sent me his address. I sent him a letter. He didn't answer, so I sent him another letter – and he answered! He said, listen, if you're interested in my music, why don't you contact Donald Garvelman in New York: he's just done a radio program. This must have been around 1970; some time had elapsed. I wrote to Donald and exchanged materials: I sent him some tapes and he sent me copies of some manuscripts. Then I moved back to the United States and met Donald. Years later we decided to go and visit Sorabji – I'm not sure of the date: 1983 or '84, something like that. I had been writing letters up till then. I was in awe of him: I was very excited about his music." In an introduction in the booklet with Habermann's new disc, Garvelmann himself explains the beginnings of his own association with Sorabji and his music and then with Habermann: "I soon became aware that Habermann's playing of his music was something totally undreamed of, not thought possible. Indeed, history has shown that Sorabji and Habermann were mode for each other – composer with his ideal interpreter. I convinced Sorabji of this and obtained his permission for Habermann to perform and record his music, music which Sorabji had previously withheld from the world." (Not strictly true: in 1976, the year before Habermann gave his first authorized performance of a Sorabji piece, in the Carnegie Recital Hall in New York, Yonty Solomon had featured four of his works at a recital in the Wigmore Hall in London.) Garvelmann continues his high praise: "Habermann faithfully honors details of Sorabji's scores to a 'T,' doesn't simplify any passages for digital convenience, and amazes by always performing from memory. But equally important is his conceptual grasp and interpretative imagination which impart musical and emotional continuity to his performances." Another sign in the porch underlined the injunction: "All calls and visits Strictly Barred unless previously arranged". My only personal contact with Sorabji was a 'phone call when he was in his early nineties, and which consisted of little more than Sorabji snapping out "yes" several times in his rapid-fire, high-pitched voice and then hanging up with a brief "Right; goodbye" before I could get to the point of my call. Habermann, as one might expect, was received more graciously. "I had trouble understanding everything he said when we met, and I was scared about getting to the piano: I left that to the very end! He spoke very rapidly and with what, to me at least, was quite an accent. And he would also sideslip into French and other languages to make his point. But it was very exciting. His handwritten letters are a little hard to read, as are the typewritten ones because they're full of typos." Indeed: I have seen a few of Sorabji's letters, and it seems odd that someone with the reputation of being a astonishing virtuoso at one keyboard should seem so hopeless at another. Did Habermann's contact with the composer result in any direct help, any indication of how he wanted the music to sound. "In some of the compositions there would be a question as to the identity of some of the notes so I would write and ask 'Is this a D sharp or an E Flat?' and send a photocopy of the page, and he would send that page back with his marking on it – and the answer would just be 'Yes'! On the other hand, I was amazed once: there was a passage in once of the pieces I had recorded earlier which opened with an a natural in the bass. And on that same page there were a number of questions. I had always though that a didn't quite sound right. I had been to the Library of Congress and checked the manuscript and there it was, an a natural. Then Sorabji put a flat in front of that note and it made all the difference! I don't know if he remembered everything or whether he was just being a devil, but there was some genius there – that's all I can tell you." What about guidance on interpretation? "Well, I did play for him and he said he really liked what he heard. I sent him some tapes, too, and he was very positive about my playing. I think he felt his job was to write the music and not to interpret it." But this was at the time of the so-called "ban" on public performance – didn't Habermann experience even any reluctance on Sorabji's part? "No, he was inspirational, the music was exciting and just the fact that he was approving of what I was doing was fantastic. It would have been nice to have taken lessons with him, but I only spent an afternoon with him. Composers have very strict ideas about what they want the composition to sound like, but you read again and again of composers who are very pleased to hear a composition performed in a way they hadn't expected. "I went through all the pieces I could get my hands on and I made a list of those that I wanted to learn. At the beginning, of course, it was everything, but now I have narrowed it down to a select group of compositions. I think half of them are playable, and some too long for my taste." But we have missed an important point: what was it that drew him to the music in the first place? "It was so exotic, so different: it wasn't avant-garde or pointillistic, twelve-tone – in fact, it wasn't anything that I had heard before, so it was very interesting." Habermann's enthusiasm raises the question – which wouldn't have bothered Sorabji a hoot – of whether his music will ever command a wide audience. Adrian Corleonis, writing in issue 18:4 of Fanfare, struck a pessimistic note in a review of Altarus' two-disc set "In Memoriam John Ogdon" (AIR-CD-9063(2)), a collection of music by Ronald Stevenson, Alistair Hinton, Busoni and Ogdon himself – all composers with direct connections to Sorabji himself and all capable of pursuing their artistic aims without courting audience favor. Corleonis, writing first of Busoni's "far more receptive, cohesive, briliant audience – socially or intellectually – than any latter-day artist is likely to be privileged to perform before, an audience […] upon which Sorabji turned his back as a composer", went on to lament that "the audience for music qua music is not merely minuscule but thinly distributed around the globe. […] What we've been pleased to call 'high culture' is becoming an ever more peripheral vestige […]". Corleonis wasn't writing about Sorabji in particular, although his music plays to the gallery even less than the composers who fell within his purview. Habermann obviously thinks the music is worth persevering with, but how does he feel Sorabji's music fits into Corleonis' downbeat assessment? "I basically agree with it. It does appeal to the converted, of course, and to people with an open mind. People do seem to get hooked on it and they enjoy it, but even they tell me that Sorabji is not going to become a household name. But there are a lot of composers like that, I suppose, who are very interesting but who will never become famous." What governed Habermann's choice of works for the Elan recording. "Well, first, I've got to be reasonable, so anything that's longer than half-an-hour or forty minutes has gotta go! It's just too many years of work." So he doesn't think in terms of what a concert audience can take? "No, it's a question of what I can do. But I do also think of the audience: I don't know if they want to hear forty minutes or one hour of continuous music – that's pretty hard on the ear. The slow movement of the Hammerklavier is taxing the ears already at twenty-five minutes. Of course, that's a wonderful piece of music, but I also think some of the Sorabji pieces are wonderful pieces of music – some of them are adorable." That brings us to another question that wouldn't even have occurred to Sorabji: why did he compose these massive pieces, so big that the majority of his works have yet to be performed, indeed, may never be performed? "I think the fact that he was isolated helped him out. It enabled him to pursue his line of thought to the n th degree, to its logical conclusion, if you will. But his isolation was also his downfall: lacking the feedback that he needed, or was willing or unwilling to accept, he just went on and on and on. That's the sad part. There is a unique quality to it, but he did tend to go on in some of the pieces." So that it became an intellectual pursuit rather than the creation of real music? "Oh, I don't know about that. I am sure that to him it was a very emotional process. But it's hard for me to put myself in his shoes and imagine composing a piece three or four hours long. To me it's incomprehensible. The pieces I have recorded I find a beautiful balance of unity and variety." Why those works – besides the two nocturnes, his recital includes two equally accessible though rebarbatively named Quære reliqua hujus materiei inter secreteriora and the Fantasiettina sul nome illustre dell'egregio poeta Christopher Grieve ossia Hugh MacDiarmid – in particular? "I have always been interested in them. I like the sound first of all. I like the melodies – and believe it or not, there are melodies in this music. Gulistan is a very sumptuous composition. I also like that fact that, well, let's talk about the dynamics in that piece. It's rather quiet, so he has imposed upon the music a false sense of direction by putting crescendos into crescendos. It's soft, it's agreeable to the ear. In some of the pieces he tried to pile climax on top of climax which I think sometimes becomes overbearing, but pieces like Gulistan and Djâmî are very lovely compositions, as if he is sharing some very intimate music with his friends, relaxing for half-an-hour." 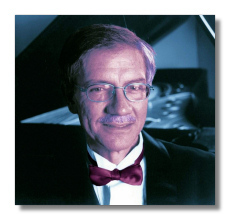 Habermann's Elan CD is made up from performances recorded in concert over a period of time. Does he prefer the immediacy of live performance even in such complicated music, where a pianist would normally be grateful for the chance of a retake or forty-two? "From experience it seems that recordings go better in live performances than in the studio. Sonically, maybe one could argue that there's more purity in the studio, but this way bypasses a big problem: I hate editing, and if that's the way I played it, that's the way I played it." 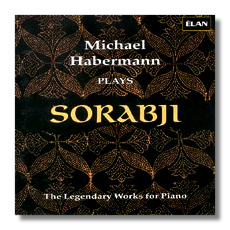 To most of Habermann's listeners, Sorabji must be an altogether novel phenomenon. What is audience reaction generally like? "Some people can up to me afterwards and they are very, very excited; they say they've never heard anything so beautiful and let's hear some more. Some other people have said that their favorite piece was my tribute to Sorabji [À la manière de Sorabji, included as an appendix on the Elan disc], because that's about two minutes long! Others don't come up at all, but then I know people who don't like Beethoven. My friends always ask me when am I going to do other composers, and I always tell them I am doing other composers, that there are a lot of other composers I am interested in, but Sorabji's music is rather difficult to play and it takes a real commitment of time. So it seems to the outside world that he is the only composer I play when in actuality I play a whole bunch of other things too. To get his pieces into the kind of shape that I want…. Well, I know this is going to sound a little ridiculous, but the problem is not the notes. There are thousands and thousands of notes and it's very complicated, and the rhythms (especially in pieces like Gulistan) are so difficult that sometimes you can spend a week on a single measure, but the real difficulty in the music is making it sound good, making it sound logical, as logical as a Beethoven sonata. That involves a lot of analysis and trying to interpret the thing. And it takes a lot of time. I could have recorded these piece years ago, but they never sounded quite right to me, so I just let them mature a little bit. I would come back to it and try something different. It's the musical part that drives me." Anyone doubting the extent to which Sorabji's music drives Habermann should look at his chapter on the piano music in the collection of essays – Sorabji: a Critical Celebration – which Fanfare's Paul Rapoport edited for Scolar Press in 1992; there it becomes plain that Habermann's knowledge is very deep indeed. Habermann's quest for Sorabji continues, one imagines, so what works would he like to look at next? "Well, I hope so. I still have to take care of the family, go to the supermarket, but I would like to put out one or two more. Not too many more. There are a lot of other things that attract me and I want to get to them. I was playing some Haydn variations and I thought: 'God, this is one of the most beautiful things I have heard'. Last week I gave a seminar on the thirty-two Beethoven sonatas and I felt like abandoning my Sorabji project – those pieces are so incredible! I did quit a job a couple of years ago: some people want me to spend some more time at the piano so I am trying to appease them. I used to compose (indeed, I used to compose quite a lot), but that was twenty years ago, so I'd like to get back to that." Are there affinities between Sorabji's music and Habermann's own? "No, I like a lot of composers, and my music doesn't resemble theirs either. I try just to do a good job. The music is very difficult to get into the fingers but once it is there you wonder how it was so much trouble to begin with: it's beautiful, it's perfectly written. You know, except for music written for other instruments – piano reductions and that kind of thing – or things that really are badly written, I have always had a problem defining 'unpianistic'." Does Habermann have any tips for the neophyte approaching Sorabji for the first time. "Pianists should just play what they like to play, if they can find something that they really like. And for listeners I usually recommend the pastiche on 'The Song of India' [from Rimsky-Korsakov's Sadko, and available on Habermann's AS&V disc]: they know the melody and they can hear what Sorabji does to it. Gulistan is also a good starting place, as is Djâmî. Finally, since this is a Transatlantic call and Habermann is paying for it, how come the connection with Elan? "I had a call from a man who said he was a doctor, who said 'I love your playing, I think you're a wonderful pianist' and I thought it was a crack call. But it was real enough, and the connection came through him."